Koreatown is marked red, which means that those areas began gentrifying from 1990. The proverbial “gentrification” is still going strong in Los Angeles Koreatown as the area continues its face-lifting period, which has led to the rising cost of living. Whereas the relatively more affluent are moving into Koreatown, those of working class who once occupied the town in the past are leaving to different parts of the city. UCLA’s Luskin School of Public Affairs recently released a map showing L.A.’s gentrification from 1990 to 2013. 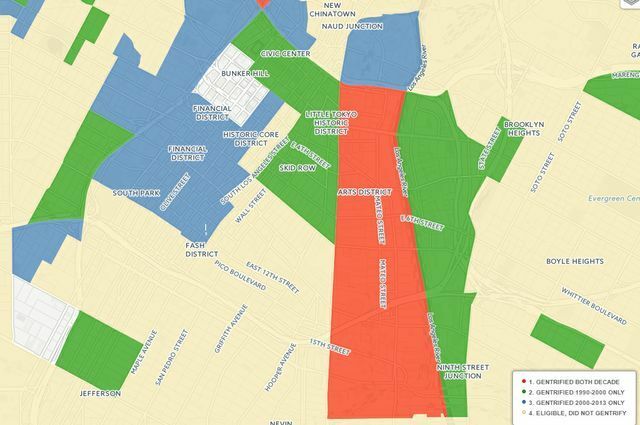 Areas across the city fall into one of the four categories; red (gentrified continually from 1990 to 2013), green (from 1990 to 2000), blue (from 2000 to 2013) and white (no gentrification). Areas affected by gentrification and rising rent were primarily occupied by Caucasians, college graduates and the highly-paid, according to the map. The area that has been gentrified to the greatest effect over the last two decades is Downtown L.A.
Koreatown, along with Mid-City, Echo Park, Angelino Heights and the Downtown Arts District, are also among the areas marked red on the map. Areas such as Venice, Playa Vista, Arlington Heights, Westlake and Highland Park were marked blue, which means that those areas began gentrifying after 2000.